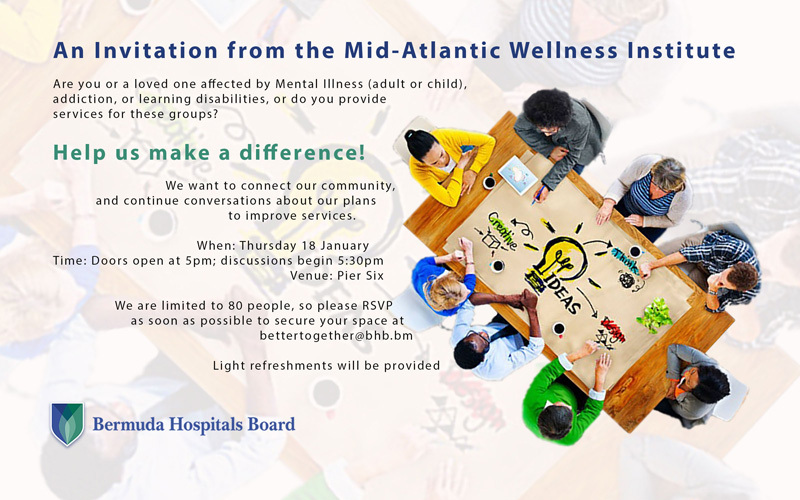 Bermuda Hospitals Board [BHB] invites people to a community conversation event focusing on improving addiction, learning disability and mental health services at the Mid-Atlantic Wellness Institute [MWI]. The event will take place on Thursday 18 January 2018 at Pier Six. Light refreshments will be provided, with doors opening at 5pm and the event starting at 5:30pm. BHB said, “Hosted by MWI staff, the event will bring people into conversations about a number of service improvements, some of which come from ideas raised in BHB’s community engagement event last February. “Anyone who is interested in improving MWI services is warmly invited to participate, whether a provider of services, a user of services, a family member or a concerned community member. MWI Allied Health Supervisor Morrisa Rogers, who chairs the MWI Engagement Committee organising the event, comments: “We hope there will be a wide variety of perspectives – this is the unique value of this type of community conversation. BHB Chief Operating Officer R Scott Pearman comments: “This event will delve deeper into the purpose and potential of specific projects across all MWI services, making service improvement a truly collaborative effort. BHB Chief Executive Officer Venetta Symonds comments: “In February we asked the community generally how can we get it right and nearly 100 people came, raising conversations that were important to them. I’m excited to see community conversations continue as I believe that opening up to community involvement in improvements gives us the best chance of making positive changes.